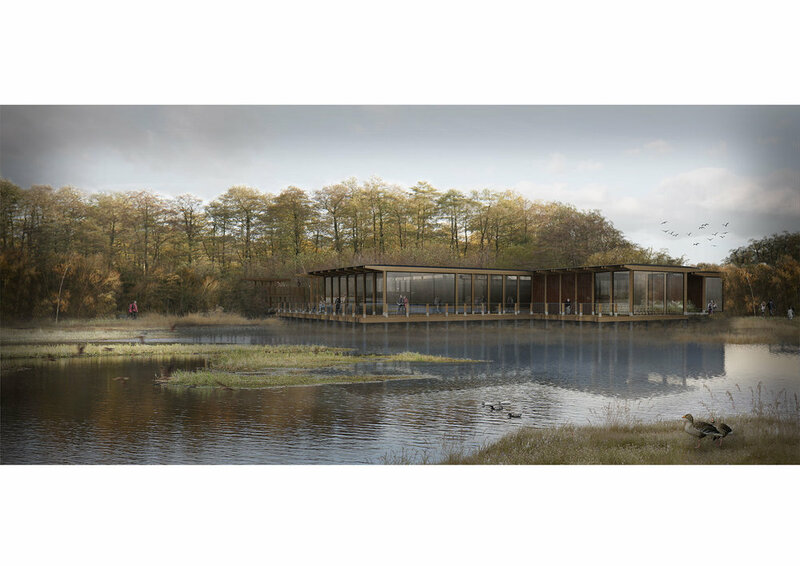 Our vision for Sevenoaks Nature and Wellbeing Centre is one of simplicity, material richness and warmth. Straightforward geometry cleverly used, physically engaged with the topography and context - a small building with a site-wide impact. The central entrance, immediately identifiable by its welcoming cantilevering canopy, slices through the volume, providing clear views through the light filled lobby to a courtyard beyond. It is situated directly on the North-South track, drawing visitors through the reception and into the reserve. A continuous, 2m wide corridor, the ‘link’, cuts through the building creating an axis linking the two bodies of water. The link connects visitors and staff to the various functional elements, bringing light into the heart of the building via high-level clerestory windows. This corridor, also accessed directly from outside, enables autonomous access to the Studio. The building is constructed as a timber post and beam frame kept clear of ground and water by splicing the timber posts to precast concrete piers rising from the foundations. The timber frame can be manufactured off-site, transported and erected efficiently using dowelled connections. Detailing exposes and celebrates the primary structural elements, formed from glue-laminated Larch, sourced from Buckland, Devon – the closest source. Infill panels between posts are full height glazing or corrugated Corten (weathered steel) panels, referencing the site’s industrial past. A highly efficient façade maximizes thermal performance of the envelope. Energy uses are kept low using natural ventilation and low energy lighting. A Photovoltaic array at roof level will generate approximately 23.7kW, sufficient to power the building’s operation, with surplus stored in battery banks for redistribution and EV charging points. Heating and hot water is via Heat Pumps. Rainwater harvesting will service the WC’s. A biodiversity roof will support vegetation selected to maintain local species. Bat and bird boxes are incorporated into the structural frame. The minimal material palette and efficient construction method responds to budget constraints while the scale of the design reflects the aspirational nature of the brief. The building’s modular system, set out on a grid, allows a high degree of flexibility and adaptability that will accommodate design evolution in response to a developing client brief and budgetary constraints. 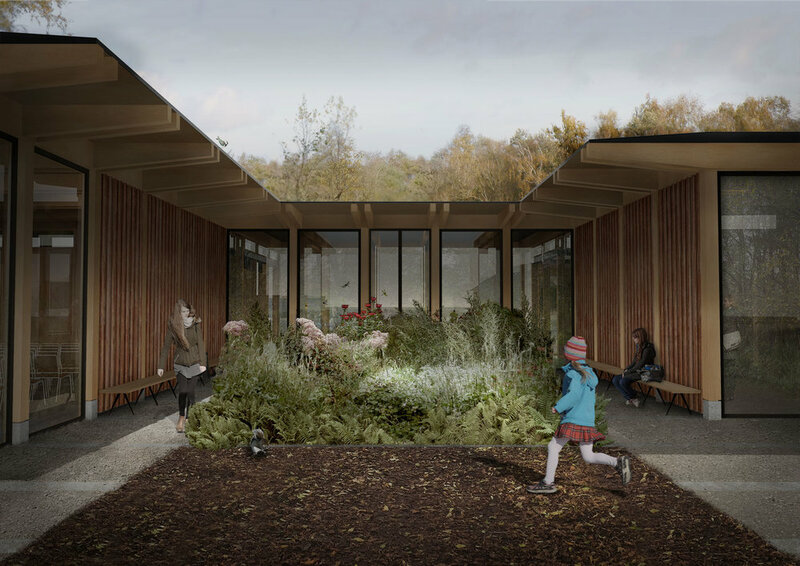 A memorable building is more likely to be visited - our idea is to keep the geometry simple, the module repetitive and the cost down, whilst using materials with history, heritage and depth to provide the Kent Wildlife Trust with a venue inspired by the landscape it inhabits.